Spokes supports ‘informed choice‘ over cycle helmets – not just ‘choice‘. Informed choice means that individuals should be told the pros and the cons of helmet use, then allowed to make their own decision. Organisations involved in selling or promoting helmets should be required to advise potential users about the pros and cons, so that they can cycle more safely whether or not they choose to use a helmet, as well as to help them in making that choice. This applies to manufacturers (e.g. on packaging), sales outlets (e.g. in sales materials), and organisations such as the police, councils or other organisations (e.g. in publicity leaflets). We are against helmet compulsion and against heavy or one-sided promotion of helmets. This makes cycling appear more dangerous than it is and so risks scaring people off and losing the multiple health and other benefits of getting about by bike. Secondly, for those who do choose to cycle, helmets may give them added confidence to use more dangerous roads* than they otherwise would. See below for evidence on these points. [*The difference in danger between different road types is staggering – see p7 of Spokes Bulletin 115 and p5 of Bulletin 117]. The huge emphasis on helmets by many public and private agencies, ‘safety’ bodies, manufacturers, shops, etc also distracts political, media and public attention from the real causes of death and serious injury to cyclists, which is where attention really is needed – as highlighted by Chris Boardman [for example, 10.8.15 and 3.11.14]. Note: Spokes is not involved in Sport, and can’t comment on helmets for sport cycling. See the CTC briefings below instead. We summarise and reference the evidence on helmets below. A much shorter summary is in our printed helmets factsheet [click picture to download pdf]. Page 1 is intended to counter the widespread publicity that helmets are an unalloyed good with no downsides. Page 2 explains some of the main issues and our stance, and provides some evidence links. Our views on helmets are reflected in our policy on advertising and on promotion of events. The way in which helmets are promoted by some public institutions and by financially-interested private organisations is leading to ‘creeping compulsion’ – a growing public mood that not to wear a helmet is irresponsible. Some charity rides, supposedly open to all, now ban all unhelmeted cyclists, or those under 18. In the tragic death of Edinburgh Cyclist Audrey Fyfe, the Sherrif blamed Mrs Fyfe for not wearing a helmet, even though the crash resulted entirely from careless driving and no evidence was produced that a helmet would have affected the outcome. An article in Spokes Bulletin 113 about helmet ‘creeping compulsion’ generated a lot of media interest, which prompted us to produce the above factsheet and a 15 June 2012 news posting explaining our position further and outlining feedback received following the Bulletin article. Our concerns are further discussed on page 5 of Spokes Bulletin 114. WhyCycle.co.uk – a website aiming to give ‘impartial’ advice on all aspects of cycling including helmets. Some good material, but high concentration on the technicalities of helmets and almost zero on the psychology of helmets except, at the very end, “as long as it does not leave you with a false sense of security” – this surely needs as much or more attention than the technicalities since not crashing at all should be one’s first priority. Bike Share schemes – evidence suggests that users of bike share schemes are usually unhelmeted, yet have significantly lower casualty rates than the general cycling population. See this major MIT study of North American bike share schemes [pdf 5MB]. Also London Boris Bikes – see page 5 of Spokes Bulletin 114. Which – conversation.which.co.uk/transport-travel/bike-helmets-cycling-compulsory-law ‘Which’ did a report on cycle helmets, and this subsequent online conversation contains some fascinating comments and useful links. Here we list one source of evidence for each of the main claims made in the Spokes factsheet. Further sources can be found in the above website and briefings. 1801 Scottish Parliament Information Service [SPice] Cycle Helmets in Scotland Briefing paper for Petitions Committee following petition seeking compulsory helmets. 1801 British Medical Journal “Bike-share schemes improve safety – helmet laws do not” Editorial summarising recent research papers on helmets and on bike share schemes. 1606 Momentum Magazine “Are Bicycle Helmets Holding Us Back” – article summarising much research from early days to the present and with fascinating graphs correlating helmet wearing with cycling death rates per country and per year. 1602 Australia Broadcasting Corporation [ABC] “Helmet-free cycling to be considered under new ACT road safety plan” – The Australian Capital Territory, which includes Australia’s capital, Canberra, is commissioning research to understand the impact on public health of removing the compulsory helmet law. Encouragingly, they seem to be open-mindedly looking at all sides of the question. 1602 The Guardian “Why My Cycling Clothing Company uses Models without Helmets” – a great article – sensible and amusing – by Nick Hussey of Vulpine. Which generated over 1000 follow-up comments & tweets, including this. 1510 The Guardian Comparing Seattle and Amsterdam Article raises many of the arguments for and against helmet use and helmet compulsion (Seattle is one of the few cities in the world with compulsion). 1509 International Cycling Safety Conference 2015 Reliability of helmet studies Paper (very technical) discussing why most studies on the benefits of helmet use are unreliable. It argues that “The risk of getting a head injury per kilometre wearing a helmet relative to the same risk with-out helmet is the most appropriate measure to assess the effectiveness of the bicycle helmet” but most studies use much more limited data, such as looking at crash victims rather than all cyclists. 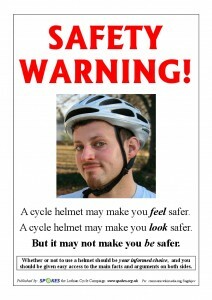 An interesting parallel with the cycle helmet debate. At the same time as a huge rise in helmet-wearing, head injuries amongst skiers have stayed static (one study) or have risen (two other studies). As with cycle helmets, an explanatory theory is that skiers are taking more risks because they feel safer, even though helmets are only very effective in low speed crashes – and ‘providers’ are colluding by building more extreme skiing facilities, assuming skiers are safer. 1102 Copenhagenize.com article on helmets for everyday motoring. 1. How much will a helmet help you, and in what sorts of crashes? A fair bit of research has been done – some is linked from the above sites. Generally speaking the message is that a helmet may help if you have a slow speed crash such as falling off and hitting your head on the road, but is unlikely to make much difference in a crash with a motor vehicle. 2. Are you more likely to crash if you use a helmet? This could happen because drivers think you are safe and so give you less space when passing; or because you feel safer and so cycle faster or use a faster road. Some limited research has been done, pointing in this direction [see links above] but very little. There are many supporting anecdotes such as the London taxi driver who said, “I always give the Boris bikes a wide berth” and the cyclist who told Spokes, “I would never use that road unless I was wearing my helmet.” i.e. the helmeted cyclist is taking on more risk from traffic; the unhelmeted bike-hire user is taking on less. The government, police, helmet manufacturers, road safety agencies, etc refuse to take these arguments seriously or to commission any serious research. They are thus potentially risking the safety of individual cyclists, by promoting helmets as an unalloyed good and not, at the least, advising wearers to be aware of the downsides. 3. Do overall cyclist deaths and injuries per mile or per bike user fall if helmets are made compulsory or become very commonplace in a country? Usually many people are put off cycling – no one has researched why this happens, but one theory is because the emphasis on helmets makes cycling feel dangerous – i.e. we aren’t told to put on a helmet to walk or drive to the shops, so cycling must be more dangerous. If the people who stay cycling are the more confident, fully equipped ones who use fast roads, and those deterred are the more ordinary unhelmeted cyclists who stick to local and quiet roads, this could explain why casualties rise – because there is a huge differential in cycling danger on the two types of road – see Spokes 115 [forthcoming] page 7. There may be more crashes per cyclist for the reasons in (2) above. 2015: A new paper looks at the critical question of where helmet laws reduce the risk of serious injury [defined as those requiring hospital for at least one night] per cycling trip. It concludes that the risk of serious injury per cycling trip is not reduced by helmet legilation. [However it was found that the risk of serious injury per trip was lower for females and in areas with more people cycling]. Source: Bicycling injury hospitalisation rates in Canadian jurisdictions: analyses examining associations with helmet legislation and mode share.